Williams, Val (2018) Supporting Women's Photography Through Writing and Curatorship. In: Women in Photography Fast Forward Workshop, 27- 28 2018, Jamia Millia Islamia. Val Williams spoke about a history of her working practice as a curator of photography. She started by introducing Photography and the Archive Research Centre (PARC) based at University for the Arts London (UAL) where she is the Director and noted that for the last 5 years all of their exhibitions have included a minimum of 50% women. She went on to talk about Impressions Gallery (The UK’s second independent photography galleries and now one of the most significant in Europe) which she started with Andy Sproxton in the 1970’s. Many of the exhibitions there were men and this is what led Val to do her first book The Other Observers; Women in Photography now in its second edition. The exhibition The Other Observers opened at the National Media Museum and went onto the Photographers Gallery – it got a lot of attention and that because it came at the right moment. 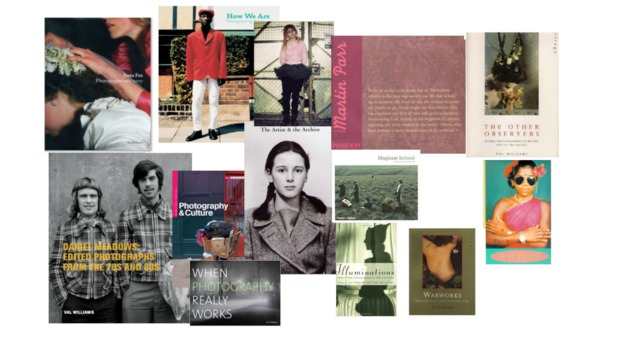 In this research project she introduced a number of women who had largely been overlooked or even not considered at all in the burgeoning histories of photography. A major part of the work for this book was looking at archives (often hidden) in big institutions. Along with discovering this lost work came a whole number of fascinating human stories and she emphasised the significance of this for today’s students to think about – research is not just about things (as in objects such as photographs) but research is about people too. During the project Val rediscovered a number of photographers who had literally disappeared including Grace Robertson whose career had faded behind the career of her husband. Val also presented Warworks, – women photographers responding to war – a large scale museum show and publication that counteracted the conventional narratives of war photography. More recently she has worked on the Janet Mendhelson exhibition and book about a body of work only recently discovered by Tish Murtha both photographers are only recently celebrated.